The Epiphone PRO-1 Performance Pack offers you everything for a successful entry into the world of the electric guitar. Besides an electric guitar especially designed for easy playability, the PRO-1 Performance Pack delivers a 3 Watt MityPRO mini amplifier including cable, guitar strap and picks. Last but not least, the set includes a Rocksmith Tone Cable for USB connection to PCs and Macs and a free download code for the Rocksmith 2014 Edition for PC and Mac to get started with the first riffs! Epiphones PRO-1 Les Paul with a zebra humbucker in ebony finish. The Epiphone PRO-1 Les Paul Junior in Ebony finish. As one of the world-famous designs of the electric guitar, the Les Paul Junior is also the instrument of choice for many professional musicians. Equipped with an Epiphone 700T ceramic humbucker, the PRO-1 Les Paul Junior delivers classic rock and metal sounds, while the specially designed EZ-Pro neck profile ensures smooth playability. To be in the right mood at all times, the Humbucker frame has an integrated Shadow E-Tuner tuner. Epiphone's MityPRO training amplifier in a handy case format. The PRO-1 Performance Pack contains the handy Epiphone MityPRO Mini amplifier for electric amplification of the guitar sound. The 3 watt guitar amp has a 3" loudspeaker and can also be used on the go thanks to its battery operation. Three controls for gain, volume and tone determine the degree of distortion, volume and timbre of the MityPRO. The amplifier's aux input can also be used to play music tracks and backing tracks, while the headphone connection allows silent practice. With the Rocksmith Real Tone Cable any common electric guitar can be used as a USB controller. 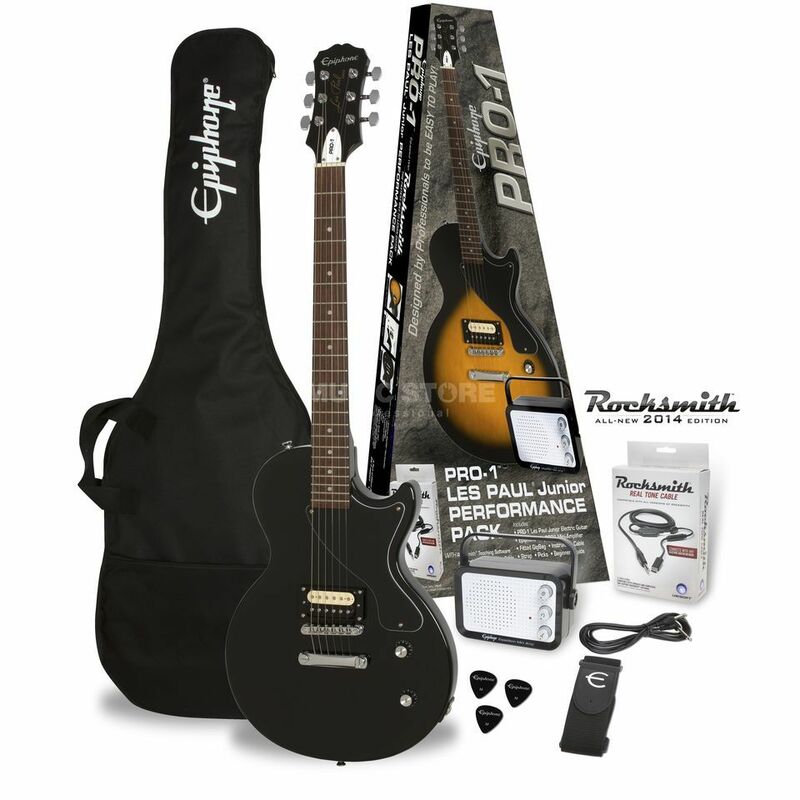 Exclusively for the PRO-1 Performance Pack, Epiphone includes a Rocksmith Real Tone Cable including a free license code to the PC version of Rocksmith! With over 50 famous songs of rock and metal you learn riffs and licks in no time at all. The Real Tone Cable allows you to connect your electric guitar to your PC via USB, making it an interactive controller.